My niece is having a birthday in a couple weeks so I made her this cute outfit and matching purse. 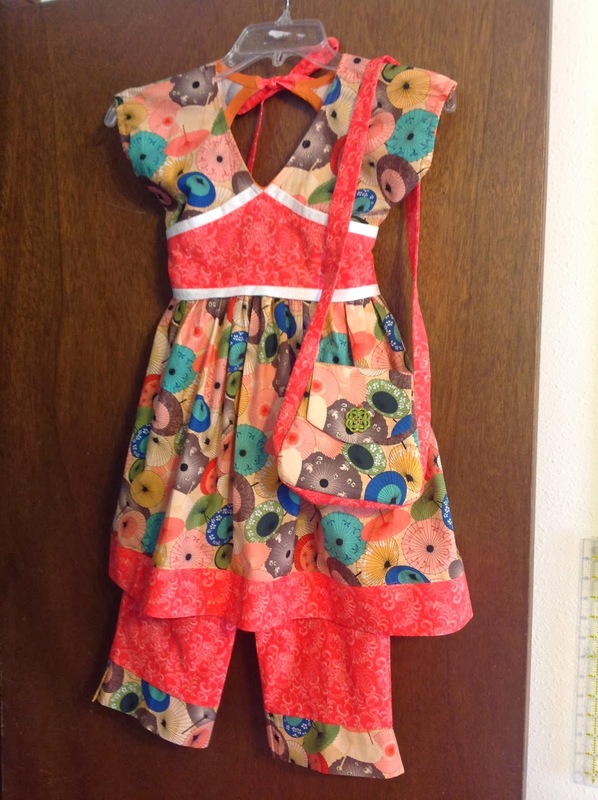 I've had the fabric for years (got it from Joann) and my original use for it didn't materialize - long story there! So...it has just languished in my pile. I figured it would be great for a little girl so when I dug out this adorable Daisy Kingdom pattern from my dusty stash of patterns-I've-purchased-because-they-were-only-a-$1-and-I-might-be-able-to-someday-use-them (I probably have about a kajillion of those in my stash) I just knew it was a match made in heaven! I love the Daisy Kingdom patterns because they are so unique and they usually have a little something extra to coordinate with the outfit - this time it's a purse. If I use this pattern again I think I will create a facing instead of using bias tape to bind the neck edges. It was a bear and I just think a facing would hold up better to washing and wearing. The little purse is probably my favorite part. My husband picked out the button and it looks like jade but is really plastic.